A war drama set in Indochina during the dying days of French involvement, China Gate offers a few good concepts but suffers from clunky execution. The setting is Indochina in 1954, with the French Foreign Legion in a desperate struggle to resist the buoyant Soviet-backed communist forces of Ho Chi Minh. The village of Sun Toy is near the front lines, still held by the French with the help of American air drops, but almost fully destroyed by enemy bombardments. A Eurasian woman known as Lucky Legs (Angie Dickinson) runs what's left of the local bar. 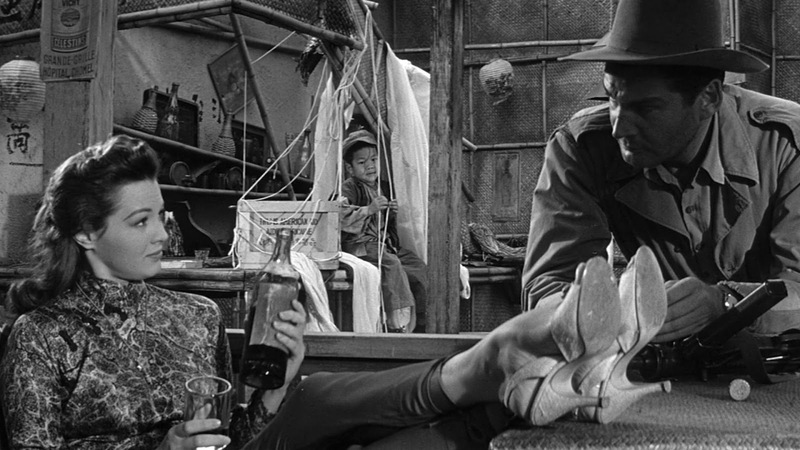 She also knows the terrain thanks to regular booze smuggling runs to Major Cham (Lee Van Cleef), the local leader of the opposing North Vietnamese forces. The Legion recruit Lucky to join a special forces mission to locate and destroy an enemy munitions depot. She agrees, but is unhappy that her American ex-husband Sergeant Brock (Gene Barry) is also part of the mission. The racist Brock abandoned Lucky when their baby was born with Asian features. Goldie (Nat King Cole) is another American member of the Legion who joins the squad. The assignment is filled with danger and skirmishes with enemy soldiers, and also affords plenty of time for Lucky and Brock to confront their past. Directed and written by Samuel Fuller, China Gate is a limited-budget, studio-bound affair, exploring the Vietnam conflict prior to the still-to-come wide scale American involvement. The acting from a decidedly B-grade cast is stiff, the sound stage settings are plastic, the supposed jungle ambience is laughable, and the frontline infiltration tactics are unconvincing and border on ridiculous. On several occasions the Legion squadron encounters a single and isolated enemy guard, and it's never explained why they don't snipe him out instead of trying to tiptoe around him, often causing noisy carnage. Fuller's real focus is on politics and racism. The film is filled with anti-communist rants, while the singular character arc features Brock's journey, starting from a despicable racist who abandoned his own child and finding his way to a caring husband and father. Neither Gene Barry's acting nor Fuller's writing are up to the task, and the emotional dialogue exchanges between Brock and Lucky, often incongruously set near dead bodies and in front of other soldiers, simply don't work. Goldie's involvement as a brave black soldier is an interesting counterpoint to Brock's racism, and Nat King Cole gets to warble the title song -- twice. Angie Dickinson often comes to the rescue of China Gate, and her performance and character are about the only thing worth watching. As a single mother very much alone in a crumbling man's world, she stands out for having a higher motive and a mission within a mission to improve her young son's future prospects. Potentially intriguing but ultimately disappointing, China Gate is lost at the front lines where promising ideas crash against low budgets bolstered by talent limitations.